There has been a metric ton of discussion and speculation on the future of Marvel’s first family. Ever since Bleeding Cool reported on rumors that Marvel’s publishing arm had been given an embargo on properties whose film rights are owned by 20th Century Fox (specifically the FF and the X-Men), every movement on the two properties has been analyzed by comic book conspiracy theorists. 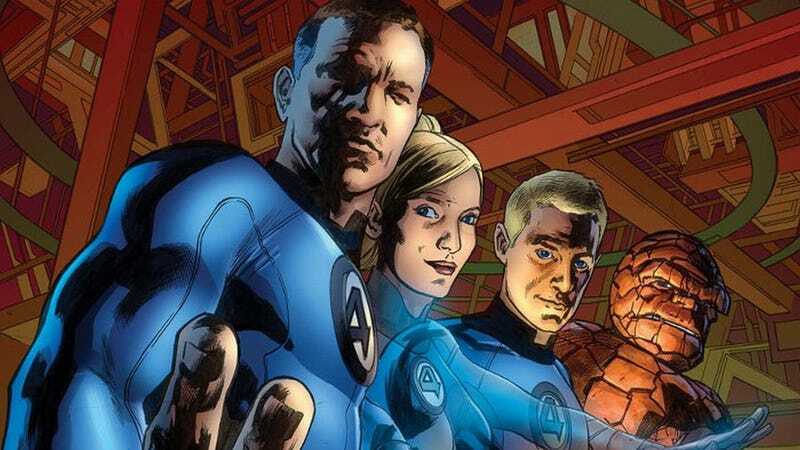 When the Fantastic Four was missing from the post-Secret Wars Marvel line-up, those conspiracy theorists took that a confirmation of those rumors. However, I don’t believe a word of it. Why? Because this has all happened before. First of all, Tom Brevoort, long-time Marvel (and FF) editor has confirmed one part of the conspiracy theory, so let’s get that out of the way. Fox owns a chunk of the rights to FF toys and merchandise. Marvel wholly owns the merch rights to all non-Fox owned properties. Naturally, Marvel is going to concentrate on toys and merchandise for properties that they’ll receive 100% of the profits from. Brevoort has confirmed that. But as for the publishing arm? The actual comics? That’s not the case. In 2004, Marvel organized an event to relaunch their Avengers line- Avengers Disassembled. The line was starting to sell poorly after several well received runs across the team and solo titles. Every Avengers title was affected, including Avengers, Captain America, Iron Man, Thor and even the Spectacular Spider-Man. In late 2004, all of the current series starring the Avengers ended and relaunched... except Thor. Thor on the other hand went through an epic story by Mike Avon Oeming titled Ragnarok. If you’re familiar with Norse mythology or the comics mythology of Thor, you’d know what Ragnarok is. The end of all things. The apocalypse. Fin. Caput. No more Thor. It would be that way for THREE YEARS. In his stead, the Sentry replaced Thor on the Avengers. Most of the mythological stories in the MU were shouldered by Hercules. There wasn’t a trace of the mighty thunder god until suddenly in an issue of Fantastic Four, a meteorite fell from the heavens, and landed in Broxton, Oklahoma. It wasn’t a meteorite at all... It was Mjolnir, heralding the return of Thor and his Asgardian fellows in a series by J. Michael Straczynski and Olivier Coipel, a superstar team if one ever existed. The gambit paid off. Three years absent after a massive event, and suddenly Thor was hotter than he’d ever been. So what does this mean for the Fantastic Four? Fantastic Four has been selling okay for the past few years, but it hasn’t been the juggernaut that it was back in the 70’s and 80’s. That hasn’t been from lack of effort, as the series has seen A-list creators such as Mark Millar, Bryan Hitch, Matt Fraction, Mark Bagley and James Robinson crafting their adventures. Marvel seems to be taking the chance that by dialing the characters back a bit, readers will be aching for them to return as a family. And let’s be honest, if Rich Johnston wasn’t stoking the flames of a supposed Ike Perlmutter/Fox feud, no one would see this move as anything but this. To go with this, Marvel is definitely taking the time to make sure the FF are done right. They have the time to do it, why not? This means we’re likely to see MASSIVE names on the next Fantastic Four run. I’m talking the level of Brian Bendis and John Cassaday, Jason Aaron and Stewart Immonen, Jeff Lemire and Adam Kubert, Dan Slott and Mike Allred or Kieron Gillen and Jamie McKelvie. Beyond that we’re not going to see a back-to-basics approach. We’re going to see the core concept updated for the modern day. The Fantastic Four are a family of explorers who protect the world from extraordinary threats that most people can’t comprehend. Look at the best runs on the series. Lee & Kirby. Byrne. Waid & Wieringo. Hickman, Eaglesham & Epting. All of them have that basic high concept in common, but each run is very much a product of its time. On paper, Mark Millar and Bryan Hitch should have worked. Matt Fraction and Mark Bagley should have worked. But neither really did Why? Because Fantastic Four works best as a long-form epic. Every highly lauded Fantastic Four run in the title’s history lasted a minimum of three to five years. Marvel will sign someone that’s in for the long haul, and it will be amazing. But whatever the case may be, the Fantastic Four will return. They’re the greatest heroes in history, and no matter what enemy they face, they will always emerge on top. Even if that enemy is cancellation.